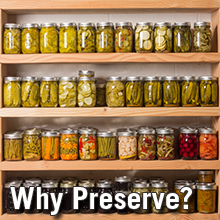 Why do foods need to be preserved? In other words, what spoils them? Enzymes: Foods begin as living systems. The enzymes that ripen fruits on briars or trees and vegetables on stalks or vines continue to ripen them after harvest. Naturally present enzymes in meats, fish and poultry continue to age them after slaughter. Unless the activities of these enzymes are stopped by heat (blanching, canning or cooking) or slowed by cold, salt, fermentation or another method, they eventually spoil foods by destroying texture, causing browning or other undesirable color changes, changing flavors and decreasing nutritional value. Oxygen: Air causes undesirable changes. It causes fats to oxidize or become rancid, turns food colors brown and adversely affects nutrients including vitamins. Putting foods in packages, cans or jars limits air. Because air is more soluble in liquids at refrigeration and freezing temperatures, air impermeable packaging is particularly important for foods in cold or freezer storage. Heating food - blanching, canning or cooking - drives out air. Microorganisms: Microorganisms are so small that they cannot be seen with the naked eye. Three types of microorganisms - bacteria, molds and yeasts – most commonly spoil foods. Some microorganisms – bacteria and viruses - can cause foodborne illness or death. Microorganisms are everywhere; many, including sporeforming bacteria that are difficult to kill, are found in soil and on plants. The scales, skins, feathers and hides of animals carry many microorganisms; many bacteria including several that cause disease (Campylobacter, Salmonella, certain Escherichia coli) are found in animal intestines. Human skin, hair and intestines carry many bacteria that can contaminate food and cause spoilage or foodborne illness. For bacteria, molds and yeasts to cause spoilage, the conditions around them must support growth. Bacteria, molds and yeast grow by doubling. One bacteria doubles to produce two, two double to produce four, four double to produce eight, eight double to produce six and so no. Under optimal conditions for growth, a few bacteria can rapidly grow to become millions. T- Bacteria, molds and yeasts need appropriate temperatures to grow. Most food spoilage types grow well at temperatures between 40°F and 140°F and quite well at body temperature. Colder temperatures such as found in refrigeration (32°F to 40°F) slow growth of microorganisms; however, some including the disease-causing bacteria Listeria grow slowly at refrigerator temperatures. Freezing temperatures (optimally 0°F or below) halt growth of microorganisms. Heat in the form of blanching, cooking or boiling kills many microorganisms. However, some hardy bacteria like botulism-causing Clostridium botulinum form highly resistant spores that survive boiling temperature; destroying its spores requires super-heated steam under pressure at temperatures at or above 240°F. T- Microorganisms need time to grow. Some will double in as few as 20 minutes. Some require longer; some shorter. O- Many spoilage microorganisms including molds grow best in oxygen. Many disease-causing bacteria grow with or without air. The organism that causes botulism (Clostridium botulinum) grows best in the absence of air. M- All microorganisms require moisture to grow. In general, molds require less moisture than yeasts and yeasts require less moisture than bacteria. Moisture occurs in foods in two forms – free water that is available to microorganisms for growth and bound water that is not available for growth. Drying, adding salt (curing) or adding sugar (jams, jellies, preserves) are ways to make water unavailable for microorganisms to grow. The acronym FATTOM will help you remember the factors that microorganisms need to grow and spoil foods – food, acidity level, temperature, time, oxygen and moisture. In preserving foods, we often take advantage of combinations of these factors. For example, in jams and jellies, heat, acidity and pH work together to preserve food. James M. Jay. Modern Food Microbiology. Ed.